It seems there is always a new, bite-sized fad on the horizon. Gourmet marshmallows! Cake pops! Fro-yo! Although some in the U.S. might proclaim the Age of the Cupcake over, I say a visit to one of Europe’s blossoming cupcakeries proves that the Age of the Cupcake is still going strong—after all, a trend that makes its way around the world is no small feat. Cupcakes are more than just sugary little treats—they’re cultural exportations. (An owner of a Berlin bakery told me that Germans first thought the cupcakes were candles.) I for one will openly admit my love of cupcakes has not flinched since high school, fads & trendiness aside. Whether you’re looking for something nearby or find yourself craving sugar while abroad, check out these memorable cupcake places. Harrods is a behemoth of a department store—a beautiful, extremely well designed behemoth. Lest the term “department store” discourage you, be assured Harrods is a must for foodies. There are rooms upon rooms of food, containing several to-go courts, mini-restaurants, and everything in between— Oysters! Barbeque! Sushi! Wine! Patisserie Hall, where Lola’s Cupcakes is located, boasts a stunning array of sweets. Lola’s Cupcakes are generously sized and the flavors, such as Vanilla Coconut and Rocky Road, are as inventive as they are beautiful. If you’re really into cute, try the “Sprinkled” cupcakes, which are dusted with glitter and butterfly sprinkles. The colorful cupcakes stand out in a sea of rich chocolate truffles and gourmet frozen yogurt, but be forewarned: the cupcakes probably won’t be the only thing you try before you leave Harrods. Cupcake Berlin was the first major cupcakery to break onto the scene in Berlin, and they have enjoyed lasting popularity ever since. Cupcake Berlin is located in the heart of the trendy, brunch-obsessed neighborhood of Friedrichshain. The place is especially popular on Sunday mornings, when you can grab a coffee and partake in the local flea markets. The cupcakes are quite a bang for your Euro and come with a generous amount of frosting. Due to the large size (and because traditional German cakes depend on sauces and fillings for moisture) the cupcakes resemble muffins in texture and can be dry at times. Cookies n’ Cream is a notable flavor, as well as The King: chocolate cake and peanut butter frosting, with a banana topper. About a year ago, British ex-pat Kay opened Vanilla Berlin in Prenzlauer Berg, only a few blocks away from gorgeous Volkspark Friedrichshain, the oldest public park in the city after Tiergarten. On sunny days the park is well attended—its green grass, many fields, and stone structures make it the perfect place to enjoy one of Kay’s treats. Vanilla’s cupcakes are delicate, perfectly baked, and flavorful. Vanilla runs a seasonal menu, taking inspiration from popular German produce (ex: rhubarb custard cupcakes) while at the same time introducing international flavors (ex: Snickers cupcake.) Because Vanilla is still a smaller venue, the bakery is flexible—you never know what you’ll find on any given day. Amaretto? Earl Gray? Apple Pie? Vanilla Berlin is well worth a visit (or three) if you find yourself in Berlin. 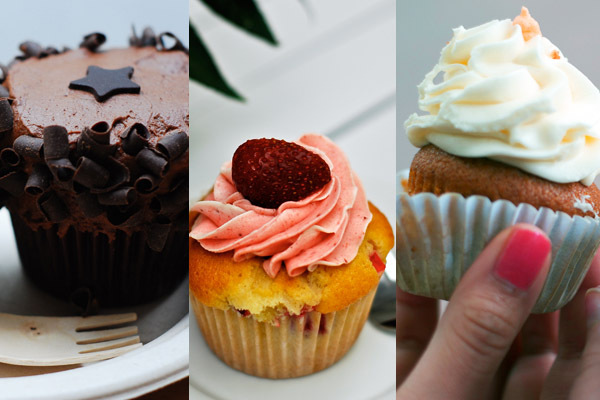 Are you at all surprised that Copenhagen’s first cupcakery would have impeccable, unique-looking cupcakes? After all, the Danes are really into design. This is a country where a certain popular chair costs almost $7000—and a 2” museum store replica costs $50. Instead of an organic piping, the frosting on most Agnes cupcakes is carefully molded, with not a sprinkle out of place. The various take-out boxes are brightly colored, and the bakery itself could double as a bar with its sleek glass & metal design. The Dark Chocolate Sea Salt, Blueberry, and oh-so-Scandinavian Licorice flavors are all recommended. Seats are limited—you might want to take your haul to go and enjoy them in one of the city’s many squares instead. Cup & Cake looks it came out of a Real Simple or Martha Stewart magazine: it sits on a little side street that has a park and rows of green trees. Inside the store, the décor is very organic, using lots of wood and natural furniture. The cupcakes are perched on glass cake plates, and you can watch employees frost the cupcakes as you wait for your order. Inside there are always small groups of people catching up over a cup of coffee. Cup & Cake offers simple flavors, probably no more than 6 different ones at any given time, but they are impeccably done—by far the best cupcakes in Barcelona. A must for frosting lovers—the frosting to cake ratio is about 1:1. Try the brownie cheesecake, with its electric blue frosting, the moist apple spice, and their version of red velvet: white chocolate frosting with cocoa cake. The to-go situation is still in its early stages—paper bags do not suit traveling cupcakes—so take a seat and relax. Georgetown Cupcake was originally the darling of DC, and its immense success led to a TV show and block-long tourist lines. But if there’s one thing DC-ers hate, it’s lines of tourists. There’s been a little bit of backlash against Georgetown Cupcake by locals that remember the days of the tiny little store that used to close a few times a day just to keep up with demand. That little store has now given way to two more, with a recent opening in NY and an upcoming Boston location. However, there’s a reason why Georgetown Cupcake has become a cupcake empire. From the trademark pink box to the understated décor to the timeliness of the employees, Georgetown Cupcake maintains an unmatched consistency while feeding hoards of visitors and filling dozens of orders. Even more impressive is that they manage to do this with a remarkable rotation of flavors. Each month means three to five new flavors—add that to the daily flavors and original flavors, and you’re looking at a selection of about 25 different flavors everyday. Local to the area? Follow Georgetown Cupcake on Twitter: every day at 11 they release a top-secret flavor, and if you order it by name, it’s yours free. If you’re in the area around 11-12:30, this free cupcake is worth a look on your smart phone. Try: Chocolate Ganache, Lemon Berry, Red Velvet. In D.C., the lines have been drawn between Georgetown Cupcake and other better-known places such as Baked & Wired, but that doesn’t mean one should settle down with the familiar. Take Frosting, for example. The brainchild of a local couple, Frosting is located right near the Friendship Heights metro station in Maryland. A partnership with Italian brand illycafe means they have excellent coffee to keep commuters happy, and they certainly have the most creative cupcake names. Joe N’ Dough, Telly Belly, and Jackie Oh! are all good examples. ‘Lectric Pink Lemonade is a personal favorite with its colorful pink jolt of citrus. A major break-through is that Frosting offers a morning menu that includes cupcakes! Doesn’t a French toast cupcake with maple buttercream sound like a delicious way to wake up? Cupcake Minneapolis is more friendly, neighborhood café than pure bakery. It has no pretension, a laid back atmosphere, and offers a lunch and dinner menu with tempting items such as black bean burgers, proscuitto Panini, and—yoobetcha—hot dish. Unlike other bakeries, Cupcake Minneapolis has ample seating space, with lots of windows and a patio. They bake their own bread, offer beer and wine, and their coffee menu is just cool—rose scented cappuccino, anyone? Oh, yes, and their cupcakes! Tempt yourself with flavors like Black Bottom and Salted Nut Cluster, but save room for their “Party Line” cupcakes, which feature various types of booze such as Kahlua and Amaretto. Salty Tart’s cupcakes are disappointing, which is strange considering this is a bakery which gets pretty much every other pastry so, so right. The frosting is overly thick, like sweetened butter. The Surly cupcake is the one redeemer (it uses a local India Pale Ale, with sour cream and fudge) but you’re better off sampling Salty Tart’s other offerings. Anything with caramel is a must, especially their rich, dark chocolate cake with caramel filling. Brioches. Muffins. Savory pastries. Cookies. Breads. Fruit tarts. Everything else will have you salivating. 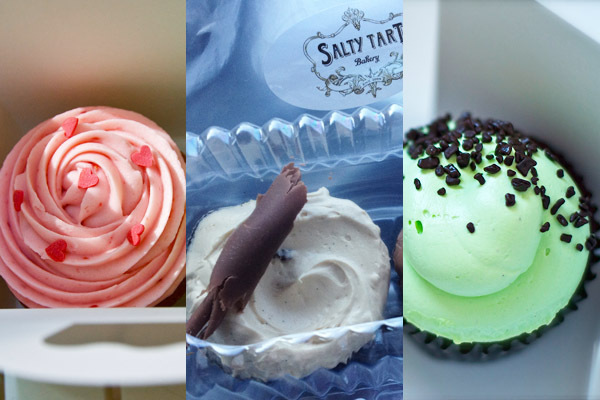 Salty Tart is a bakery in the larger sense of the word, so cupcakes aren’t the main focus, although hopefully they will continue to work on them. But don’t let that worry you—you’ll forget all about cupcakes once you try anything else on their shelves. Kenzie Zimmer suffered several relapse cravings during the course of writing this article. She lives in Minnesota and is currently surviving her fourth winter with ungodly amounts of soup. And Sprinkles now has a cupcake vending machine in LA that’s open 24 hours! We’re a gaggle of volunteers and opening a new scheme in our community. Your website provided us with helpful information to paintings on. You have done an impressive job and our entire neighborhood shall be grateful to you. Hello there, I found your internet site via Bing when evaluating a connected make a difference, your website came way up, it appears to be for being beneficial. I’ve combined with favourites features and functions|included in this social bookmarks.